We have high quality control standards. Our technicians are the finest in the water conditioning industry. You can expect our service team to be professional and courteous, to always make sure your questions are answered, and to do the highest quality work. 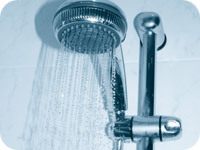 Frey Heating and Plumbing is your source for clean and healthy water from every tap in your home. We install water purification products: From whole house water filters, water softeners, iron removal systems, and complete well water systems. Frey Heating and Plumbing is on top of the newest technologies available to help you...Fall in love with your water...all over again!